One of my friends has just had her second baby, another boy, the day before her own birthday. We – my group of school friends – all went to see her a couple of weeks ago for a combined birthday and baby shower celebration. I wasn’t sure if I was going to be able to go until the last minute as we already had two other things on that weekend – a relative visiting and my father in law’s birthday – but we were able to arrange things so that we were able to go. Making cakes for celebrations when we get together is usually my thing so I couldn’t turn up empty handed, but I didn’t have the confidence I would have enough time in between taking care of my five month old to make anything really elaborate so I decided to keep it simple. One of my friends is vegan and I remembered seeing a recipe for a vegan chocolate cake in Tea with Bea, the recipe book from the Bea’s of Bloomsbury café. I used white wine vinegar instead of the red wine vinegar given in the recipe as I had a bottle in the cupboard already (and white wine vinegar is often used in vegan baking so I knew it would be ok). I made a simple vegan buttercream from Pure dairy-free spread, icing sugar and cocoa powder. The guideline cooking time was given as 40-55 minutes with an extra 5-10 minutes if necessary, which is quite a large range. I found the cake needed the full 65 minutes, in fact I think I left it in even for slightly longer and it was still really light and moist. 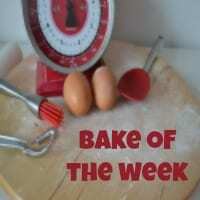 For more baking recipes including baby shower cakes check out my other blog Caroline Makes. I bought a gold cake pick with the word ‘baby’ from my local party store to go in the top and sprinkled the top with edible gold lustre dust. The cake tasted really good – if you are new to vegan baking and need reassuring, this cake tastes even better than a lot of non-vegan chocolate cakes! Preheat oven to 160C. Mix the flour, cocoa powder, bicarb of soda, baking powder and salt in a large bowl. In another bowl, mix the soya milk, vinegar, sugar, oil and vanilla, whisking until combined. Fold into the dry ingredients and mix well. Grease an 8 or 9 inch cake tin and spoon in the prepared mixture and bake for 45 minutes to 1 hour (I’ve increased the cooking time slightly from the original recipe). Test the middle with a skewer and bake for another 5-10 minutes if needed. Allow to cool in the tin then turn out onto a baking rack. When cool, make the buttercream – cream together the marg and icing sugar. Carefully slice the cake through the middle and spread with the buttercream. You can spread buttercream over the top and around the sides as well if you wish; I left mine plain and decorated the top with edible gold lustre powder. Looks good! I have found the combination of soya milk and bicarbonate of soda in vegan cakes to be really effective. It seems to give a good rise.